In the United States last year, one percent of all total trips on the road were taken by bicycle, however the rates of injury and death as the result of bicycle related accidents has gone up in recent years. In New Orleans, our great bicycle lawyers deal with clients in accidents everyday. In 2015, according to the Centers for Disease Control and Prevention, there were over 494,000 emergency room visits as the result of bicycle accidents, with over 900 deaths occurring. With the risks of injury and death to cyclists growing, it is important for victims to know their legal options. 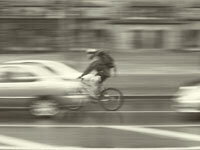 Bicycle accidents happen all over Louisiana, and our Louisiana Bicycle accidents attorneys fight for those clients. Clients who have been injured as the result of bicycle accidents are not the only ones who suffer from physical and emotional injuries. Often times their family members are equally harmed as a result. Being a relative of a cyclist killed in a road accident can have even further devastating effects on your life far after your loved one’s passing. It is equally troubling when the accident was the result of a reckless or negligent driver. In this case, both surviving victims and surviving families of deceased victims are faced with difficult questions about their options; the answers to these questions have tremendous impact on the future of victims and their families. The first pressing issue for surviving victims is to make sure that all of their medical needs are met. Many severe injuries such as head, neck, and nervous system injuries are always a major concern in bicycle accidents. Broken bones and internal injuries may also be severe enough to cause significant future medical complications. It is important that you have an experienced attorney to ensure that your medical bills are taken care of and to ensure that your insurance company will continue paying for future treatments as the result of your injuries. For surviving family members of victims who have died as the result of bicycle accidents, an experienced attorney is also necessary to ensure that all outstanding financial obligations are taken care of and that life insurance payments are properly dispensed by your insurance company, to ensure that you and the family that your loved one left behind will be taken care of. It is also important to have an experienced attorney to ensure that justice is served and that the parties who have harmed you or your loved one by their negligent or reckless actions are held accountable. Our firm is committed to seeking justice for victims and their families who have been harmed by others while cycling. At such a difficult time, you and your family need an advocate that will pursue the perpetrators of the harm and ensure that they are held accountable through appropriate relief to you and your family. While no amount of relief may be enough for those who have been injured or those who have been left behind, our firm strives to provide the best service and advocacy for our clients, while maintaining the highest degree of professionalism. If you or a loved one has been injured in a bicycle accident or you are survivor of a loved one who has been killed in a bicycle accident, contact us online or call us at 504-527-6225 to set up a FREE consultation to discuss your legal options.